Written by Travis Ralls. Media by Ethan Maurer. For as long as I can remember, I have always loved the game of baseball. There’s something about the strategy of the game—the time-consuming, tedious work needed for success—the failure, and the feeling of pure elation when you come up with a clutch hit at a key moment in a game. In my opinion, there is no other game that will push you to your emotional limits like baseball does. The best players in the game fail seven out of ten times. Baseball is a very humbling game. There have been many instances throughout the course of my career where I have questioned not only my skill level but if I really wanted to keep pushing, to keep grinding when I have not had a hit in my last twenty-five at-bats. 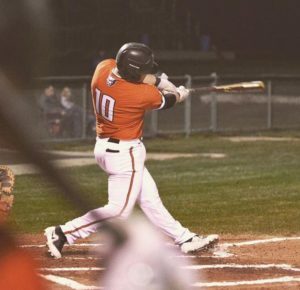 Hitting a slump at the plate can become one of the most frustrating, yet humbling experiences. However, how we react in these moments is a huge sign of character. Baseball is an incredible test of character and simulation for life. In life we fail—we have slumps, we hit hard times. Just like in baseball, how we react in these moments of trial are the true representations of our character. 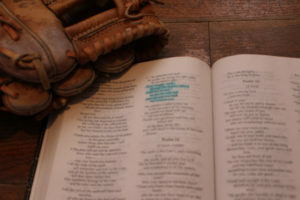 Without Christ, my baseball career and more importantly, my life, is meaningless. In my slumps both on the field and in life, I must rely on Jesus Christ for my strength. It’s a tough pill to swallow, but without Christ, I am nothing. I am broken and sinful. Because of that fact, I deserve eternal death. In Romans 6:23 the Apostle Paul writes, “For the wages of sin is death, but the gift of God is eternal life in Christ Jesus our Lord.” Because of my sinful nature, I deserve to be cast out and receive eternal damnation. But because of the love of God and the sacrifice of His Son, we are all free from that. My life should be a constant battle to be more like Christ and to share His story through my words and my actions. God has blessed me with the ability to play baseball—my talents are not my own. 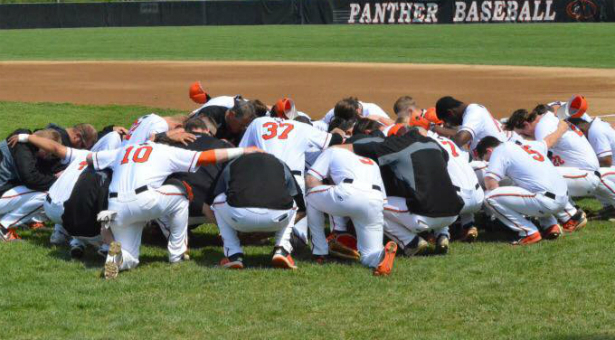 As part of the GU Baseball program, one of our Panther Covenants is having the “Attitude of Christ.” I will be the first one to admit that I do not always do this as well as I should. The easiest thing to do when I am in a slump is to get frustrated and angry: to lash out, to blame the umpire, and to be focused on myself and my struggles. It is the same thing in life. When I am going through a slump in life, the easy thing is to get angry, to lash out, to blame the circumstances, etc. That is not having the attitude of Christ. 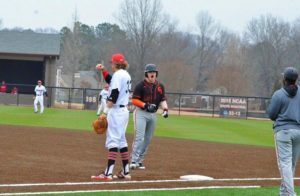 Ralls celebrating a clutch single. In baseball and in life, I will go through slumps and hardships. In both situations, although the easy thing is to get angry and want to give up, I must trust in the Lord and carry on. In Psalms 23:4, David writes, “Even though I walk through the valley of the shadow of death, I will fear no evil, for you are with me; your rod and your staff, they comfort me.” We will all go through slumps in life. However, we should not be fearful in difficult times because Jesus is walking alongside us.